Naim's modular Fraim racking system is much more than a simple 'me too' product, as Martin Colloms discovers. Designed some years ago by Naim's chief engineer Roy George, in response to his frustration with the weaknesses of available equipment supports, the Fraim is manifestly not a back-of-an-envelope variation of other manufacturers' efforts. Rather it is perhaps the only example of support furniture that has been specifically created by a major electronics manufacturer, in this case to match the carefully designed, vibration controlled mechanical pathways engineered within Naim electronics. While Naim Audio's individual components arguably benefit more from anti-microphony and vibration control measures than those of other manufacturers, this costly effort remains at risk if the mechanical design of the entire audio system is not continued down through the stand to the support plane of the floor. Furthermore, important relationships between specific components, such as magnetic fields and vibrations from power supply transformers, may well predetermine the relative locations of audio components on one or more racks. The more that I investigated this Naim support system, the more I started to see it as a fundamental component of the Naim hierarchy. In terms of potential sound quality benefit it could well be considered an important audio component in its own right. Indeed, without proper support, a given component might never attain its full potential. I must admit I didn't initially take this project seriously. Little has been written about the Fraim, and many consider it 'just proprietary Naim racking', to be recommended and sold by Naim dealers alongside the electronics. Some even consider it a bit pricey, and after more than a decade of availability, it is frequently taken for granted. However, a recent interaction between a review turntable and my long term Finite Elemente Pagode reference supports, which have served me well for many years (particularly when spike-coupled to suspended floors), suggested that further experiment for my present hardwood-on-concrete floor might be worthwhile. I therefore asked to borrow some assorted ex-dem Fraim components. Initially enough turned up for 'half' a stand (comprising the base and a single shelf), but results were promising enough to order a full review set and commence exploring the various possibilities. Naim's approach to electronic engineering can sometimes result in equipment combinations which are a rod for its own back. Its two-box units combine a massive power supply with large toroidal transformer in one enclosure with an absorptive foot, with a matching audio unit which may use delicate internal anti-vibration measures, and usually benefits from physical and vibration isolation from the matching supply. Yes, they'll continue to operate when the components are stacked, but the best sound may not be obtained. My test system currently uses three of these two-boxers: a Super Line phono stage, an NDS streamer and a NAP300 power amp. For this review I was concerned to establish how the sound of the several Naim components (and also others from Krell, Marantz and Townshend) altered as they were located in the racking systems. Fraimis modular, based on a system of stacking shelves, each with three-point self-locating and levelling support. The stack begins with a Base unit in composite veneered wood which is coupled directly to the floor via three adjustable spikes. Its top surface contains three cups which are used to locate the sturdy cones fitted beneath a second very similar looking platform or Level, which also has three cups (for adding further Levels). This second platform then supports a square sheet of special toughened glass that actually comprises the platform on which the component is placed. This glass platform is supported at three points on hardened steel balls, located in tricontact, hardened, stainless steel cups. Once a Base is built, placed and levelled, it is simple to add additional stages. These comprise a single composite wood plate veneered in a choice of woods, the toughened glass equipment shelf and its tri-ball support arrangements, plus vertical spacer spars of extruded anodised alloy. The latter come in three heights: 115mm, 190mm and 264mm, so components from Naim and other brands are easily accommodated. These open stages simply stack on further tri-point mountings, requiring no further alignment. There's no limit to the number of stages, even to eye level, but the isolation and damping performance of the system is reduced in proportion to the number of stages. (Four is considered optimal, including the open topmost stage.) 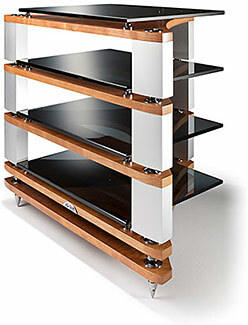 The glass shelves are 452mm wide by 340mm deep and the overall base size is 642mm by 442mm. The uprights may be in silver or black while the veneered platforms can be in light ash, cherry and black ash. A typical four-shelf assembly costs about �2,200, depending on the spacer heights chosen. Once levelled, no adjustments are required, and it will remain in alignment almost indefinitely. While no mechanical component can be free of resonances, the geometry of the supports and interfaces will strongly affect behaviour. Numerous Fraim design details reflect a classic approach to vibration control, including non-rocking tripod mountings for every level including the floor interface. The potential weak links are the wood composite support stages but the tri-lobed and pierced design minimises mass and thus energy storage, while the shape also inhibits structural and bending resonances. The interfaces, where differential materials are in contact (wood to steel, steel to glass, ball and sharpened point to stainless steel cups) are all designed to inhibit resonances, dissipate vibration energy and control structural coloration. The idea is to take the 'audio signature' out of the stand, then provide a dissipating support without self resonance, and offer a structure which conveys energy into the floor without further audible signature. No Sorbothane or similar hysteretic materials are present, and while these can at times selectively improve some aspects such as transparency, they may also slow timing and dull dynamic expression. Also, thanks to its highly modular design it is easy to reconfigure the stands to accommodate different and/or additional equipment. 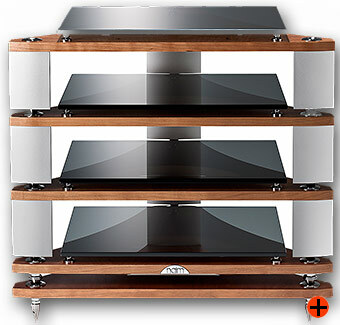 While the full and original Fraim support system gives the best results, Naim has more recently introduced the much less costly Fraim Lite rack, which eliminates the glass shelf and extends the wooden platforms to support the rear corners of the components. That initial test with the Spiral Groove SG2 turntable was very revealing, as a pervasive bass excess pertaining on other supports was almost wholly tamed by the Fraim, allowing the merits of this fine player to be expressed in my system. Encouraged to persevere, the Linn LP12/Radikal/Keel/Naim Aro/Koetsu Vermilion vinyl disc player was sequentially set on three side by side comparison units: a Finite Elemente three tier, a Mana four tier, and a Fraim. No longer available, the Mana had that sense of speed and almost exaggerated dynamics for which this design is well known, coupled with upbeat timing and clear rhythms. The Finite Elemente was more laid back, sweeter, with a neutral midband, fine image depth and focus, and a fine grained treble, but also with somewhat slower rhythms and a slight loss of subjective impact and dynamics: more 'international high end', if you like. After some repeat comparisons we got an idea of the Fraim's effect, and the performance gain with the Linn LP12 was salutary. Whereas it had always shown a comparatively articulate and tuneful bass with crisp dynamics and upbeat timing, previously unsuspected mists now seemed to clear, and the sound took off, accelerated to a new level, sounding clearer faster more upbeat and more dynamic. This was a substantial improvement for a very highly tuned LP12 package (a combination priced at about �20,000), and in my system I considered that the Fraim made the greatest single contribution to LP12 replay sound quality. The second stage of the process was the allocation of another level to accommodate a Super Line phono pre-amp, plus a second Fraim to support the matching SuperCap DR power supply (and other power supplies). A degree of synergy became apparent with the Fraim supported Super Line consequently sounding improved. The addition of further Fraims made it possible to allocate all the power supplies to the central stack, the final link being a further stack with both the control unit, the NDS source, and the NAP300 power amplifier. As each component was installed the characteristics of speed, clarity and dynamic expression, seemed to accumulate and further enhance rhythm. As the system became fully rebuilt on Fraims, that elusive sense of transparency was also successively enhanced until it matched the established Finite Elemente standard, at least with the review audio components, which also included a Meridian 200 CD disc drive, a Marantz CD555SE and Townshend and Krell line level controllers. Provided the owner is not too hamfisted, the Fraimis easy enough to use. I would set aside an hour to build and align a four level unit, and some care may be needed to avoid sliding the glass shelves out of position when messing about. The moderate depth shelves and a central vertical spar at the back might create difficulties with some equipment and cable routing issues; shorter electrical connectors may be needed, or a particular component might have to be placed on the essentially unobstructed top deck. However, this stand design is clearly a tour de force in supplying effective acoustico-mechanical vibration countermeasures. Every seemingly simple part is designed, dimensioned and fashioned for the purpose of vibration control and energy dissipation, and so far everything I have placed on these stands has sounded significantly better (especially Naim gear). In this respect, the Fraim has to be regarded as an important audio sound quality component in its own right.